Save Jane to your Collection. Register Now! Jane Keyoner received a BFA from University of Nevada in 2010. Her paintings hark back to an age before digital technology. Figures are depicted in isolation, often in front of the sea, to symbolize impermanence, and she favors subjects with great narrative detail. Keyoner’s influences include Edward Hopper, Wayne Thiebaud, and French Impressionists, and oriental prints. Her work has been exhibited locally. pic a; in loving memory of a dear one,lost at sea. 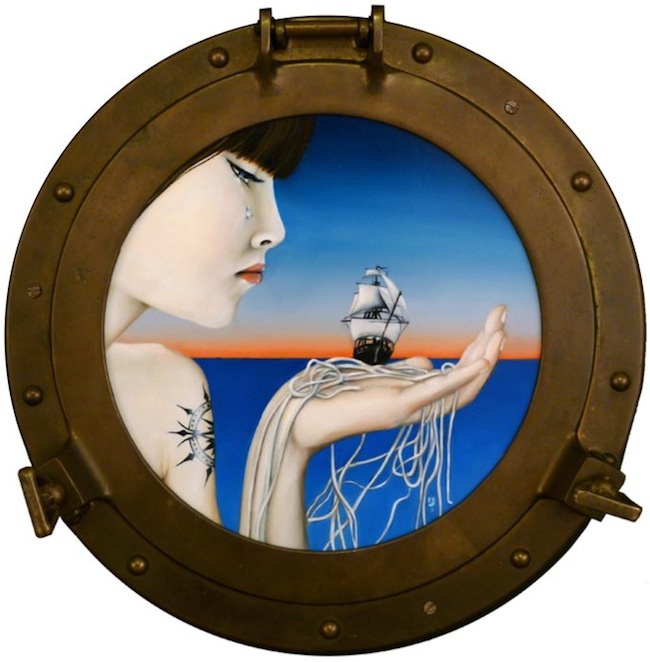 pic b; a ship on sail is on transit through a strong but tender emotions of a lady. WOW! These are truly amazing. I love the detailing and the thoughts provoked from your artworks presence. Do you sell any of them? The first thing i thought when i saw this was that it relates to the recent nuclear plant meltdown in Japan. Through my lense, an asian woman sheds a tear, while holding a boat, whose anchor- is unanchored. She, like mother nature does this. She changes the direction of the wind. She moves the plates of the earth. We are at the will of mother nature. All of this is seen though the window of a boat- as if we are on a boat, a different boat, but another nonetheless. It could have been us, but it was them. In the second painting there is the backside of a woman. Stretched across this woman is a tatoo, a gigantic tattoo. It looks like it hurt. It looks like tension. Those ropes that hold the weight of sails in the wind are suspended- parallel the lines of the spine. Pull to harness the wind and it may hurt, like a pulled nerve. One last thing. These are all ancient merchant boats, not of today. what was expressed could not have been with a nuclear or a diesel ship. They are interesting paintings. 'She is North'- all elements for sadness, the tear. only one tear, where all the pain is concentrated! 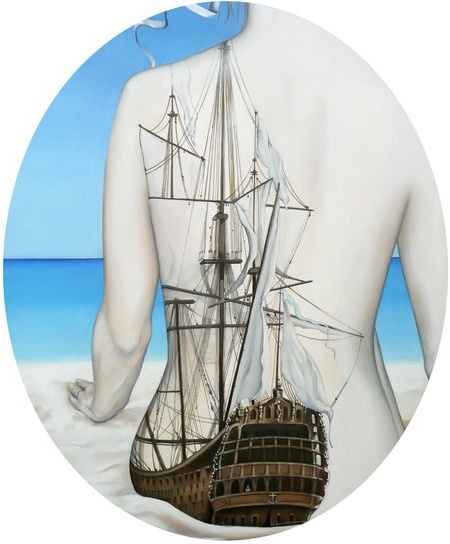 She, is that the figure depicted of the young woman, or the ship? true. literature has always treated ships humanly, pardon the pun. in other words, ships were compared to women, ladies, even venerated ones...the colour blue also adds to the repressed feelings, those feelings of being in the lowest of places, and feeling accordingly...thanfully, one is to rejoice at the thought that he/she can only go up!who would want to stay down always?there's however, a horizon in view, a new start!will it be the same?hopefully, not. the dar brown circle, lcoket to symbolise a circle. something that came full circle. brown? a very earthy colour. those threads in the left palm? threads perhaps of an unhappy life...maybe? but, she's so young and so sad!truly paradoxical...I like very much the austerity of the brown frame, reminiscent almost of seals of sturdy tanks made of steel. in fact, you'd find inside a ship, a boiler...being locked stock and barrel is just the signature needed to mark an END! very very nice... except her face is a little pouty... is there meaning behind that? These beautiful pictures that this artist has created leaves a beautiful imagery of an ocean view. These pictures have beautiful calm and relaxing colors. To my understanding her beautiful paintings have caught many wonderful peoples attention. 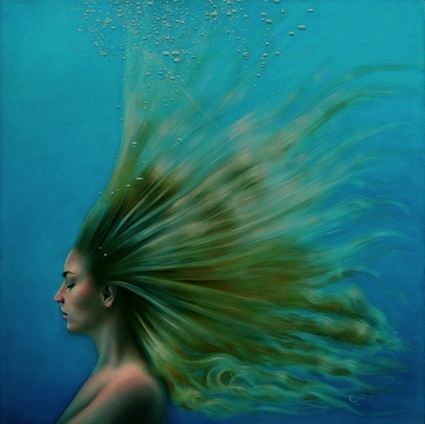 She expresses most of how she feels using soothing colors and a very calm place like the ocean. I love these paintings!!!!!! And I Quote.... " Everyone has a talent for something, its if you put your all into it." just amazing, details astounding - Jane Kenoyer is definitely an artist to watch - the paintings draws you in - I like the fact you become part of it - listening to you on Youtube gives a more personal and great appreciation for your work - thank you. This is sad and depressing. I liked it until I saw the tear falling from her eye. I do really like scenes of oceans and boats, however, but the sad part needs to leave and be replaced by peacefulness and happiness.